This is dragging on to the point of embarrassment. I really have to pull my finger out, one last push and the job will be done. 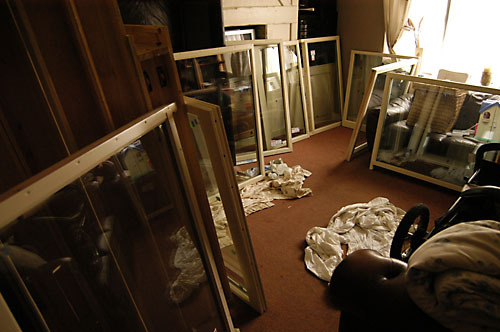 At the moment the living room is full of sashes and frames, painted ready for final fitting. I just always seem to find a excuse to be doing something else. So maybe tonight I’ll crack on? Actually getting the windows in will be a fantastic achievement the culmination of many years research, designing and a good many hours building. I need to keep my eyes on the prize and actually finish the job. Then there will be nothing holding me back from finishing the plans I’ve been promising for so long. I have been doing a bit and have broken the back of the illustrations. I’ve got loads of photos of all the various stages, processes and details. I’ve even planned out the various chapters and contents. It all needs pulling together and writing. IT WILL HAPPEN! This entry was posted on Tuesday, July 26th, 2011 at 1:06 pm	and is filed under I do DIY stuff. You can follow any responses to this entry through the RSS 2.0 feed. You can leave a response, or trackback from your own site.